Hot on the heels of Prayer Week Europe followed Prayer Week North America 2019. 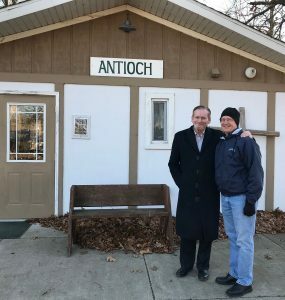 Jim’s return from Ukraine on Saturday January 12 was delayed by an unscheduled overnight stay in Toronto causing barely enough time to unpack and do laundry before repacking and driving north to the FaHoLo conference center (Faith, Hope, Love) in Grasslake, Michigan. 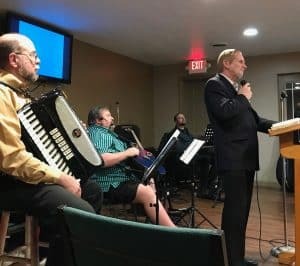 This was the third year Healthcare Christian Fellowship and Ukraine Medical Outreach partnered to begin the year with prayer directed toward seeking God’s plan for healthcare in North America. This year our week was organized by HCF Detroit branch and their leaders Karl Bandlien and Kathaleen Wupio. The theme was Unity in Christ. On Monday participants began to arrive. 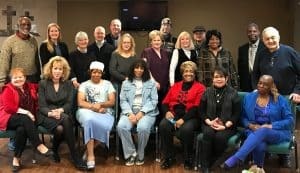 Most of the group was part of the HCF group in Detroit and part of the Volunteer Chaplaincy Program. Within the next 48 hours we were joined by Eithne Keegan representing Aubrey Beauchamp and the HCF group in California, Kristy Schmitt of IHS Global and Godfrey O’Neal from Houston. The worship team led by Mike King brought us into the presence of God to pray at the beginning and end of each day. This theme of unity and a new beginning was evident in all of the sessions led by Chris Steyn, president of HCFI; Jim Peipon, president of UMO; and the local leaders from Detroit, Karl Bandlien and Kathaleen Wupio. Even the name of the building where we met, Antioch, meaning new beginning, reflected this theme. The evening sessions were blessed by reports from Eithne about how she became involved with HCF and Kristy regarding the work of IHS global and the Saline Process. 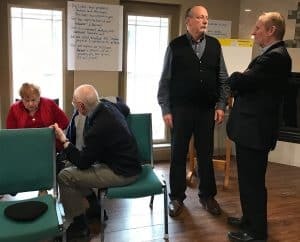 Fellowship between sessions allowed for the building of relationships between participants so vital for the work of God to continue and grow through healthcare in North America. Another key verse for North America was Isaiah 43:19 “See I am doing a new thing! Now it springs up; do you not perceive it? I am making a way in the desert and streams in the wasteland.” We pray that God will raise up individuals in the healthcare field with different gifts and talents to be used together in one body, the body of Christ.